Requires full sun and a moist or dry soil. M. sacchariflorus Occasionally produces silvery plumes. Mid green leaves with a silver midrib. Height 200 to 300cm. Spread 90cm. Can be used as a windbreak. M. sinensis ‘Golden Bar’ Green leaves, have transverse, yellowish markings. Height 60 cm. Spread 45cm. M. sinensis ‘Kleine Fontane’ AGM Red purple flowers age silvery pink plumes, July to October. Deep green, narrow leaves with a silver midrib. Height 100 to 150cm. Spread 60cm. M. sinensis ?Kleine Silberspinne? AGM Silvery pink plumes, September to November. Grey-green, narrow leaves. Height 140cm. Spread 60cm. M. sinensis ‘Malepartus’ Flowers open silver become fluffy white as they dry, August and September. Green narrow leaves. Height 200cm. Spread 120cm. M. sinensis ?Morning Light? AGM Silvery plumes, September to November. Thin green leaves, margined creamy-white. Height 120 to 200cm. Spread 120cm. M. sinensis ‘Nippon’ Upright pinky red plumes late August onwards. Green narrow leaves. Height 150cm. Spread 90cm. M. sinensis ‘Silberfeder’ AGM Arching sprays of pale brownish-pink flower heads, September and October, often laste well into winter. height 180cm. Spread 60cm often more. M. sinensis ‘Sioux’ Silvery pink flower heads, Narrfow green leaves. Height Compact and upright to 120cm. Spread 90cm. M. sinensis ‘Strictus’ AGM Green leaves, have transverse, yellow bandng.. May carry fan shaped panicles of seed heads in autumn. Height 1.2 metres. Spread 45cm. M. sinensis ?Variegatus? Grey-green leaves, heavily striped with cream. Rarely flowers. Height 1.5 metres. Spread 60cm. M. sinensis ?Zebrinus? AGM Green leaves, have transverse, yellowish white markings. 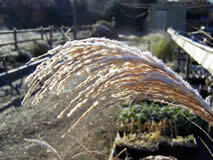 May carry fan shaped panicles of seed heads in autumn. Height 1.2 metres. Spread 45cm.